Writing about music is probably one of the most frustrating things in the world. I am in awe of people that can write music criticism clearly and engagingly because I just cannot do it. How do you describe why something does or does not move you internally? Come to think of it, perhaps it’s not that different than writing about faith or a loved one or movies. So I’m not sure why writing about music eludes me. Yet it does. Yet here I’m going to try and tell you about my favorite album of this past year anyway. When it was announced that Arcade Fire was coming out with a new album this year, I would have bet you a $100 that it was going to be my favorite record of the year. The Suburbs, their previous album,hit me like a ton of bricks. I played it for months. It was the soundtrack to the first several months of my first son’s life. Its tracks found its way into Bible studies I wrote and even a sermon I preached. I haven’t listened to Reflektor in its entirety. I will. I just haven’t bought it yet. So…yeah, I would’ve lost $100 if I made that bet. The album that did end up dominating this last part of the year? 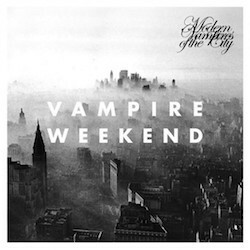 Vampire Weekend’s Modern Vampires of the City. That was unexpected. Before this record, the only thing by Vampire Weekend on my phone was “A-Punk.” I read some positive reviews back in the spring, caught them on SNL in May, and thought that maybe I should check them out. But I didn’t and pretty much forgot about it after I slipped down the rabbit hole that is my summer. I’ll start with the music because that is what I am most woefully unqualified to write about. Modern Vampires sounds like a gallery of paintings. What I mean by that is you can hear this insane amount of musical influences in each song. But it doesn’t sound like they’re aping these various styles. They combine these colors in their pallet in a way that gives them a unique quality and thus each song is a painting full of color, a piece unto itself but tied into the other works in the gallery. That’s all I’ll say about the music, other than “Diane Young” is one of the most infectiously fun songs I have heard in a long time. With it’s almost rockabilly “baby, baby, baby” lines, it’s a throwback that also somehow manages to look forward too. Thematically is where Modern Vampires really spoke to me this past year. The album is haunted by the concepts of growing old, mortality, and God. Having turned 30 this year and experienced the birth of my second son, it is hard for those themes not to resonate. But the interesting thing is that Modern Vampires provided a bit of a funhouse mirror view on these things. The band is rooted in the urbanity of New York City where I have grown up in the suburban South. Skepticism in matters of faith seems to be the default in their culture (see “Unbelievers”) whereas here belief is almost taken for granted. Yet I could identify with so much in this Bizarro World to the extent that calling it a Bizarro World is horribly inaccurate. Yet all of this is taken not so much with a fatalistic attitude, but with one of acceptance. That is something profoundly refreshing in a culture in which “aging” is a dirty word and we try to deny our mortality. As “Step” puts it “Wisdom’s a gift, but you’d trade it for youth. Age is a honor, but it’s still not the truth.” There is a great deal about maturing, moving on, and recognizing that we only live once without being moronically YOLO about it. And then there’s God. I already mentioned “Unbelievers,” in which frontman Ezra Koenig struggles with the knowledge that the fire awaits unbelievers, that he falls into the category, yet he feels like he is tied to train tracks concerning that. Koenig was raised Jewish and multiple songs read like the verbal wrestling matches with God that are found throughout the Hebrew Bible. Like I said, I come from a different perspective, but I can readily identify with that struggle. Seeing that struggle from the other side is illuminating. The pinnacle of this struggle is “Ya Hey,” which I think is a beautiful, brutally honest song that sounds like the modern day echo of Psalms. The writer addresses a deity who loves everything even though it is unloved by Zion, Babylon, America, and the singer himself. The author wonders about his mistakes, but also asks if God wonders about possible mistakes made by the Almighty as well. The whole song is challenging and almost confrontational, yet there is almost some kind of affection to it is as well. And that final question just hangs. It doesn’t resolve. I imagine that it could resolve for a lot of listeners. Pitchfork refers to the song as a kiss-off and I could easily see others thinking the bridge where the singer’s soul swoons upon hearing a song represents some sort of reconciliation. It’s open to interpretation, which—again—is not totally unlike the Psalms. But I do think that the question lingers and I think that is why I like the album so much. The lingering keeps me coming back to listen, reflect, and think. Maturity, mortality, and matters of faith are things that you don’t just solve, dust off your hands, and move on. It is this beautiful, complicated, and sometimes chaotic struggle. Those words could also describe Modern Vampires of the City. That’s why it was my favorite album of the year.